In an attempt to revitalize her creativity and particularly her writing career which had gone stale, Weam Namou enlists in an online shamanic mystery school. 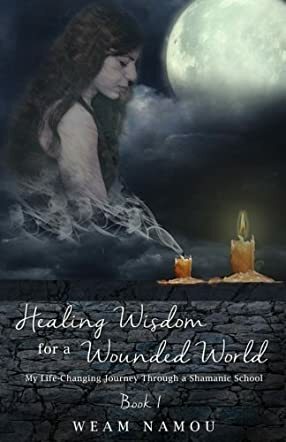 This book, Healing Wisdom for a Wounded World: My Life-Changing Journey Through a Shamanic School, chronicles the realizations of her first year of guided self-exploration. Spiritual insights are juxtaposed with biographical details as well as insightful historical notes as the author, who was born in Iraq, explores how her life path influenced her attitude to the obstacles and challenges she has faced. While facing frustrating cul-de-sacs in her career goals, a delicate balancing act is required to fulfill obligations to her family without neglecting her own inner nourishment. Along with Weam, we learn more about how to identify different types of nurturing energies, as well as the underlying significance within the feminine creativity. Only by recognizing society's blockages within her soul, can Weam progress and reconnect with her own individual voice as a writer. Healing Wisdom for a Wounded World by Weam Namou is an honest and detailed account of one year of self-exploration. Within the narrative, the author explores layers of cultural influence as well as personal history, and chronicles some of the challenges faced by young children when their parents decide to immigrate. But it is particularly meaningful, given her origins within the region often termed as the cradle of civilization. It is this that makes her story, in part, the story of us all. The Western mindset often indulges in a blissful ignorance of its roots and connection to Middle Eastern civilizations thousands of years old. Add to that the sacred fire of Native American wisdom and a pattern of intricate diversity is woven. In exploring who she is, Weam also holds up a guiding light to where we all come from, intellectually and culturally, and rediscovers some of the age-old struggles of the soul that continue to define our society. It is this that sets the book apart as more than a mere New Age memoir.